Then the answer is yes to any of the above, dental implants can help you. Dental implants are a stress-free solution for people who want to eliminate the embarrassment cause by missing teeth. Quick and convenient procedures. Traditionally, dental implant procedures required up to a year or more to complete, and often involved many visits. At Crossbank Dental Care, we can offer a 'Permanent Teeth in a Day' solution meaning you can have some new provisional teeth on the very same day as surgery! Only the best technology. At Crossbank Dental Care, we have a CT scanner (3D x-ray) enabling us to visualise the implant site beforehand, and then plan your procedure accordingly. I.e. 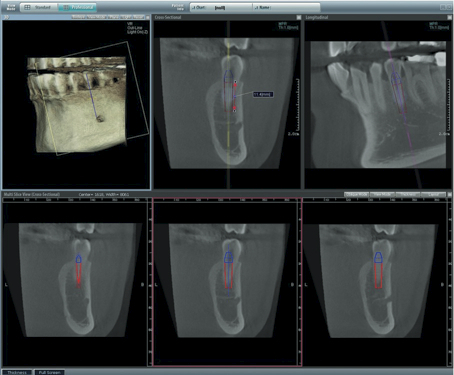 the best size, position and orientation of your implant is planned before you attend. This innovation greatly reduces the need for painful, costly and more invasive bone grafting surgery. We have the only privately owned CT scanner in Cumbria, allowing us to visually plan your dental implants meticulously. The Ewoo Vatech 3D imaging system has an extremely low radiation dose (about 30 times less than a hospital CT scan), and provides high-quality images for us to work with. Book your consultation today, and talk to us about how CT scanning can play a part in creating your new smile with dental implants. Flexible payment options. At Crossbank Dental Care, you can be confident we do everything possible to ensure that your treatment plan is easy and affordable. We make sure you know exactly what your treatment plan includes, and how much it will cost. The price you're quoted is the price you'll pay, with no additional or hidden charges. We accept credit cards, cash and cheques and offer financing options to make payment as convenient as possible. Once your treatment starts, we perform a detailed initial work up including impressions to make models of your mouth and digital photography. This allows us to prepare everything necessary for your implant placement and the restoration of your teeth. On the day of your surgery, we remove the necessary teeth and can sometimes immediately place the dental implants. For qualified candidates, we then prepare the implants for immediate restoration of the teeth. You will have the choice of a light sedative if you are anxious. Special posts are attached to the implants to support either a single tooth restoration, or an implant supported bridge. Following the placement of the abutments, our team takes a final impression to allow our technicians to make your final replacement teeth. Once made by our technicians, the new teeth are carefully fitted to ensure the correct bite and appearance are achieved. For the first year after your implants are fitted, 3 free check-ups are provided to ensure that your implants are working well. These complimentary appointments are only short, so you may wish to combine them with other activities in Kendal. These will most likely be at 1 month, 4 months and 10 months after your implants are fitted. We will recommend regular hygiene visits to keep your implants in perfect health. With any surgery, there can be some discomfort, but this is normally mild and very well controlled with the painkillers we provide for you. Placing one implant normally causes less discomfort then placing several. Sedation is commonly used to help reduce any anxiety during the process. Most patients report they were much more comfortable following the procedure than they had anticipated. You will be prescribed all the medications you need to ease any discomfort that may occur.